Most of us spend the most part of the day at the workplace. 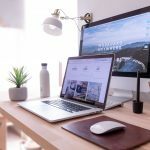 At the office or at home it’s important that our workplace reflects the kind of energy we desire – for the sake of our well-being and productivity. You can start with small steps: to organize your desk, some archives, to add a new decoration piece, that special mug, some family photos, an air-purifying plant, and after, if that is the case, designing the all room. Remember that professional achievements depends on a set of factors, so, why shouldn’t you start to surround yourself with a work environment filled with good vibes? In this sense, if you want to know how to Feng Shui your workplace, we have some tips that might help you. Check it out! Feng Shui is an ancient Chinese art that studies the influence of elements and environments on us. It’s based on the circulation of Chi, vital energy present around and in every being. For thousands of years, the Chinese have used this science to improve their daily lives, work, family, social and love relationships… always thinking on prosperity. The first thing to know about how to Feng Shui your workplace is that it should be kept clean. Dirt serves only to accumulate negative energies. Dust, food remains, full bins, for example, prevent the proper circulation of Chi through the workplace and creates a heavy environment. Who likes to work in such an environment, where it smells bad and where everything we touch is dusty? So, to improve your relationship with your work, you should start to clean and promote a healthy workplace. Chi energy may run the risk of stagnating if you have lots of stuff in your workplace. Try to hide cords, organize your papers, and make sure there is a place for everything. A spotless place promotes the energy you need to fulfill tasks while a cluttered one will drain your energy. Placing your desk facing the entrance of your office will also help you to be less stressed out, since you will be prepared to attend to business and people that comes in. If you can’t move your desk, place a mirror so you can still see the entrance. If you are lucky enough to have windows in your workplace, make the most of it. Natural light keeps you calm, peaceful and focused. If you are not so lucky, you should know that fluorescent lights may do their job but can make your eyes sour – what will make you more tired. Replace them with full-spectrum lights or table lamps that are healthier for your eyes. Remember that good lighting will improve your productivity. Your special mug, a decoration piece, one or two of your favorite books, a board with a motivational phrase will make you feel more comfortable in your workplace. In some way, it brings to your office a piece of your home – or the energy of your special place in the world. A family photo, for example, will remind you what are you fighting for and will give a boost to your work. Another important thing to know about how to Feng Shui your workplace is the balance of colors and textures that surrounds you at the office. Too much of one thing makes the room too heavy and hence a balance of different things creates a welcoming, warm and peaceful environment. About the colors, you should know that each one of them represents one of the five Feng Shui elements: fire, earth, metal, water, and wood. For example, orange it’s a great color to use in offices, since it conveys joy, excitement and leads you to success. Yellow favors creativity and symbolizes wealth, abundance and prosperity – types of energies you would like to have in your workplace.